The health effects of “combustible” tobacco products including traditional cigarettes and hookah are well-established, but the potential dangers of e-cigarettes have not yet been extensively studied. 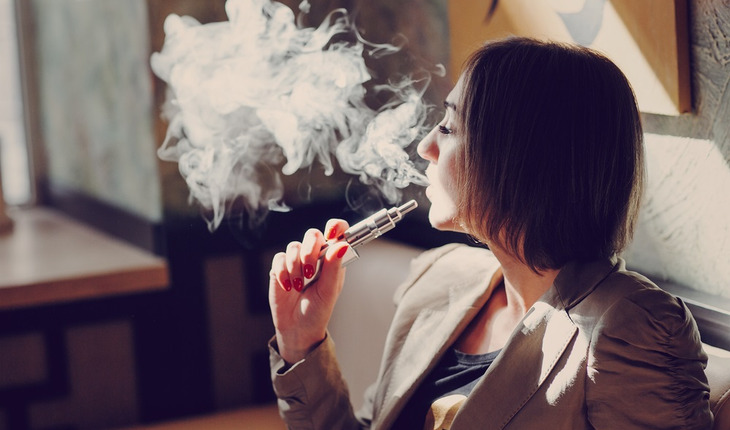 E-cigarettes are battery-powered devices that heat a liquid — including tobacco-derived nicotine, flavoring and other additives — and produce an aerosol that is inhaled. Nine chemical flavorings – menthol (mint), acetylpyridine (burnt flavor), vanillin (vanilla), cinnamaldehyde (cinnamon), eugenol (clove), diacetyl (butter), dimethylpyrazine (strawberry), isoamyl acetate (banana) and eucalyptol (spicy cooling) – which are widely used in e-cigarettes, hookah, little cigars and cigarillos were tested for their short-term effects on endothelial cells, the cells which line the blood vessels and the inside of the heart. Researchers found all nine flavors were dangerous to cells in the laboratory at the highest levels tested, and all the flavorings impaired nitric oxide production in endothelial cells in culture (outside of the body). Several of the flavorings – menthol, clove, vanillin, cinnamon and burnt flavoring – resulted in higher levels of an inflammatory marker and lower levels of nitric oxide, a molecule that inhibits inflammation and clotting, and regulates vessels’ ability to widen in response to greater blood flow. Endothelial cells were collected from volunteers (nine non-smokers/non-e-cigarette users; six non-menthol and six menthol cigarette smokers) and tested in the lab. Researchers found that both groups of smokers had a similar deficit in nitric oxide production when stimulated by a chemical called A23187. Nonsmokers’ cells that were treated with menthol or a clove flavoring also had impaired nitric oxide production, suggesting those flavorings cause damage like that found in active smokers. “Our work and prior research have provided evidence that flavorings induce toxicity in the lung and cardiovascular systems. Flavorings are also a driver of youth tobacco use and sustained tobacco use among smokers,” Fetterman said. A key strength of the new research was that it directly tested effects of just the flavorings, at levels likely to be reached in the body. Limitations include the fact that testing did not heat all the flavorings or include other chemicals used in e-cigarettes. Also, the study gauged just the flavorings’ short-term effects and captured these with cells outside the body, not inside. “We still don’t know what concentrations of the flavorings make it inside the body,” Fetterman said. The American Heart Association cautions against the use of e-cigarettes, stating that e-cigarettes containing nicotine are tobacco products that should be subject to all laws that apply to these products. The Association also calls for strong new regulations to prevent access, sales and marketing of e-cigarettes to youth, and for more research into the product’s health impact. The National Heart, Lung, and Blood Institute, Food and Drug Administration Center for Tobacco Products and the American Heart Association funded the study. Statements and conclusions of study authors published in American Heart Association scientific journals are solely those of the study authors and do not necessarily reflect the association’s policy or position. The association makes no representation or guarantee as to their accuracy or reliability. The association receives funding primarily from individuals; foundations and corporations (including pharmaceutical, device manufacturers and other companies) also make donations and fund specific association programs and events. The association has strict policies to prevent these relationships from influencing the science content. Revenues from pharmaceutical and device corporations and health insurance providers are available at http://www.heart.org/corporatefunding.